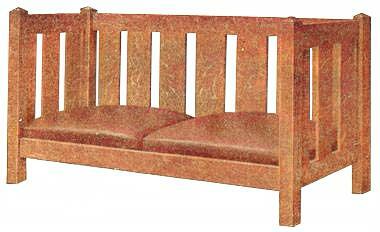 Click here for detailed settee bench plans 1. This handsome piece of mission furniture is designed to be made up in three different pieces, the only changes necessary being in the length of the one front and the two back rails. The settee bench can be made into a three-cushion length by adding the length of another cushion to the dimensions of the one front and two back rails. A companion piece chair can be made by using suitable length rails to admit only one cushion. The following stock list of materials ordered mill-planed and sandpapered will be sufficient to make up the settee bench as illustrated. Oak is the most suitable wood which can be finished in either mission or a dark golden oak. 3 rails 1 by 4 by 52-1/4 in. 4 end rails 1 by 4 by 24-1/4 in. 4 posts 2-1/4 in. square by 34-1/2 in. 13 slats 1/2 by 5 by 21-1/4 in. 2 cleats 1 in. square by 51 in. All the rails are mortised into the posts for a depth of 5/8 in., also the slats are mortised 5/8 in. into the rails. The material list gives the exact dimensions for the rails and slats as they will not need to be squared for entering the mortises, provided you are careful to get all lengths cut to dimensions. When cutting the mortises take care to get them square and clean. The posts have 1/2 in. extra added for squaring up and cutting the corners sloping on the top ends. The joints are all put together with glue. Nails can be driven into the posts intersecting the tenons of the rails on the inside, as they will not show and will help to make the settee bench more solid. 4 pieces 1 by 2-1/2 by 26 in. 8 pieces 1 by 2-1/2 by 24 in. 4 pieces 1 by 2-1/2 by 22 in. 2 pieces leather about 29 by 31 in. An open box is made from two 26-in. and two 22-in. pieces, and across the bottom are mortised and set in four 24-in. pieces to form slats on which to set the springs. The tops of the springs are tied or anchored with stout cords running in both directions and fastened to the inside of the pieces forming the open box. These should be tied in such manner as to hold each spring so it cannot slip over and come in contact with another spring. Roan or pebbled leather are very popular for cushions for this style of furniture. The leather is drawn over the springs and tacked to the outside of the open box frame. When complete the cushions are set in loose on the cleats, which should, in this case, be placed about 1 in. from the top of the rails.